In recent years, many investors have added precious metals to their portfolio for various reasons including hedging in case of inflation or a sharp devaluation of the dollar against other leading currencies. 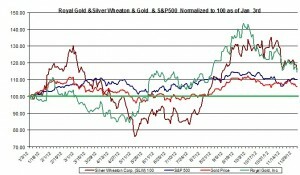 Despite the strong relation between gold and silver, they haven’t performed the same. Moreover, silver and gold companies differ from one another in certain aspects. Let’s compare between silver and gold and between gold and silver companies to better understand the difference between these investments. The strong correlation between gold and silver is well known and straight forward: during the year, the linear correlation between the daily percent change of gold and silver ranged between 0.7 and 0.9, which is a very strong and positive relation. Many believe that gold is leading this relation, because gold is a larger market than silver. A quick comparison between ETFs reveals that gold’s ETF, SPDR Gold Shares (NYSEMKT: GLD) has a much higher market cap than silver’s ETF, Shares Silver Trust (NYSEMKT: SLV): GLD’s market cap is nearly $73 billion compared to $10.5 billion for silver’s. Another comparison, between global reserves of gold and silver, shows that gold has a much higher market cap: the world official gold holding is nearly 35,000 tonnes, at a price of $1,700 per troy ounce, which comes to a market cap of $1,912 billion; global silver reserves are 530,000 tonnes, at a price of $33 per troy ounce, which comes to a market cap of $562 billion. So we know these two metals have a strong relation and gold is most likely leading the charge in this relation. Despite these factors, during the year both precious metals have performed differently as gold rose by only 5.7% (year-to-end) while silver increased by nearly 11.3%. In the past year and a half, however, gold remained stable and slightly rose while silver tumbled down from its high levels during the first few months of 2011. As I have showed in the past, the price of silver has a much higher standard deviation than the price of gold has. This means, the volatility of silver is much higher than that of gold. Therefore, the price of gold seems a bit steadier than silver even though it has under-performed silver during the year. Let’s examine two major precious metals companies: one mostly related to gold and another mostly to silver and compare their performances. 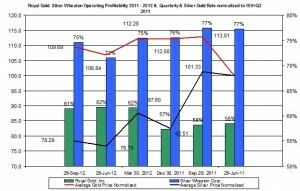 The chart below presents the average quarterly normalized prices of gold and silver (as of the second quarter of 2011) and the operating profitability of two major precious metals companies: Royal Gold (NASDAQ: RGLD) and Silver Wheaton (NYSE: SLW). These companies have different business models but are both big companies in the silver and gold industry, receptively. 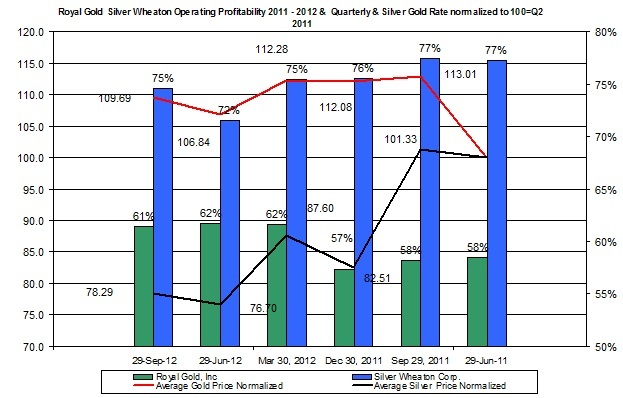 In terms of operating profitability Silver Wheaton has consistently done much better than Royal Gold. Moreover, even though I didn’t add other gold producers to this comparison, such as Barrick Gold Corporation (NYSE: ABX), gold producers didn’t have a higher profitability than Silver Wheaton had. 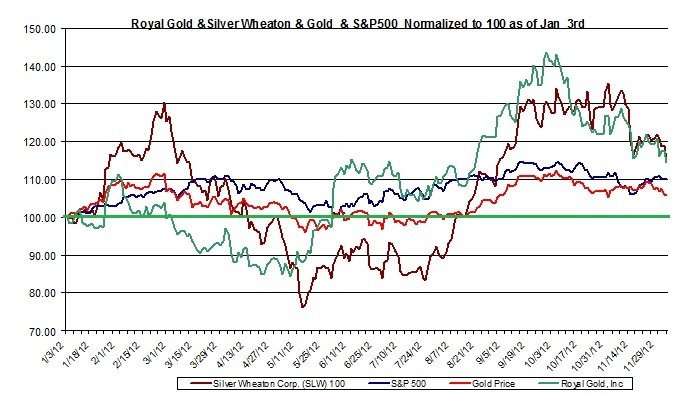 During the year, shares of Silver Wheaton and Royal Gold have risen by very similar rates, although Silver Wheaton was more volatile than Royal Gold. Moreover, both precious metals stock have outperformed not only gold but also S&P500. The chart below presents the developments of the above-mentioned indexes. In terms of dividends, Silver Wheaton is paying a relatively low divided: as of the past quarter the company paid $0.07 per share which comes to 0.8% annual yield; Royal Gold paid $0.2 per share, which comes to a 0.99% annual yield; Barrick paid $0.2 per share, which is an annual yield of 2.39%. In the comparison above between Silver Wheaton and Royal Gold we saw that Silver Wheaton has a higher profitability, pays less in terms of dividend yield. Nonetheless, both companies’ stocks have increased by nearly the same rate (up to date). In this comparison between gold and silver there isn’t a clear cut answer which investment is better, it depends on the investor’s expectations, risk aversion and belief in the future progress of precious metals. I think for more conservative investors who wish to hedge against inflation and devalue of the USD, gold or gold companies might be a more suitable investment. Investors who wish to be riskier and be rewarded for it might lean toward silver and silver companies.